Why are we called The Dreamers Woods? Why are we called The Dreamer’s Woods? We named The Dreamer’s Woods in honor of Eric’s father-in-law, Kenny Robbins who was called “Dreamer”. Kenny Robbins was always dreaming. As a young man, he dreamed of preaching the Word of God. He became an ordained minister and went on to pastor over eleven churches. Kenny was passionate about music and dreamed of a ministry through music. He became involved in several gospel singing groups throughout his life, but his most notable accomplishments happened when he became a music evangelist to truck drivers with whom he had spent many years driving cross-country for over a million accident-free miles and to whom he was known via CB handle as Dreamer. Kenny, Dreamer, toured the country singing and ministering to truck drivers with whom he passionately desired to share the love of Jesus. Over the years, Kenny had recorded either singly or with groups ten albums, but as Dreamer he recorded his most famous work in yet another six records. Kenny’s song “No Scales In Heaven” topped the charts at number one on truck radio and remained thus for over a year. After 9/11, Kenny decided to come off the road to be home with his family more. He was still known to all as Dreamer. When at home, Kenny spent a lot of his spare time working in his woods. He had a deep love of those trees of his. In fact, when Hurricane Katrina hit the Gulf Coast, he lost a lot of his trees and after that babied the remaining ones more than ever. He told Jennifer that he had found a diamond in the rough on his property. He said he had found a prayer haven within his trees. He said it was just so peaceful and serene. So, he started to create a small retreat in the center of those pines. It truly is a special place, even today. There is just a sense of time out of time that allows a person have a little tranquility in an increasingly hectic world. One of the things Kenny always said was “you have to have a dream and then you have to work to have that dream; that’s the secret.” In November of 2008, Kenny “Dreamer” Robbins went to Heaven where his greatest dream was finally realized. After Kenny’s passing, Eric and his wife Jennifer wanted to honor her father as well as his life. Since Dreamer had treasured his beloved trees so much, they decided to rename their business The Dreamer’s Woods . Kenny was very proud of his son-in-law’s work and loved to brag to all his friends about the wood carvings Eric creates. He especially loved the mountains and the different trees , the rivers, and the fishing found in Alaska. He was incredibly proud that he was able to go to Alaska to see his daughter and her family. He once told Jennifer that because of her adventurous spirit he had gotten to see many beautiful places in the world he might not have ever had the chance to see. Eric and Jennifer hope to create a place for people to experience something of the wonder and tranquility of Alaska, of nature, and especially of the woods that her dad experienced. So, when you come in for a visit, we hope you capture some of that dreaming magic. We’ll be happy to help you create a memorable keepsake in the form of our unique chainsaw carved sculptures for you to take home to remember your trip to The Dreamer’s Woods. Got a question or a comment about this article? Click here and let us know. We would be glad to hear from you. 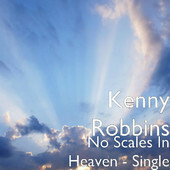 We have recently added Kenny's song, "No Scales in Heaven" to iTunes. If you would like to download a copy of that song, please go to iTunes and look for Kenny Robbins "No Scales in Heaven".